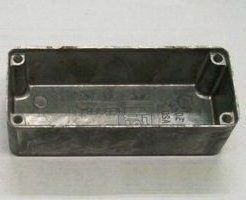 Description of Aluminum Boxes, Aluminum Enclosure Castings and Aluminum Housing Die Castings The terms "aluminum enclosures" and "aluminum housings" are the same. 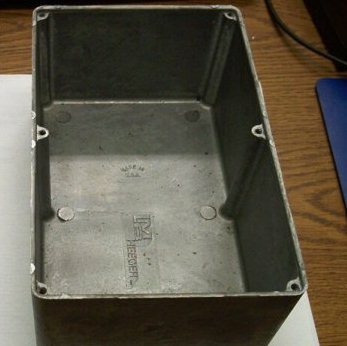 Aluminum housings and enclosures are boxes die casted for many reasons. Die cast aluminum housings require less labor in assembly than other processes. Die cast aluminum enclosure parts are produced at a faster rate than other manufacturing processes. Aluminum housing parts weigh less then steel fabricated parts. Aluminum Housings or Aluminum Boxes are electrically conductive and can be easily be electrically grounded. Aluminum box enclosures can be produced with the mounting holes necessary for installing circuit boards and covers or lids to the enclosures to seal from moisture and damage to the components assembled. Aluminum enclosures work well with aluminum heatsink parts to remove and disipate heat from components. Die cast box parts do not require welded seams, so they usually look better. Depending on the size and weight of the parts, Aluminum boxes, aluminum enclosures and aluminum housings can be produced at the rate of a few hundred to a few thousand parts each day. Aluminum Box Enclosures or Aluminum Box Housings Parts are easily powdercoated. Request Aluminum Box Die Casting Prices. Aluminum Box parts are electrically conductive benefitting manufacturers. The enclosures and housings are easily grounded. Enclosures are a natural shield for RF and EMI. The part weight of aluminum parts is less than 1/3 that of steel. Automobiles and trucks use enclosures inside engine compartments. Computer companies use housings for disk drives. Electrical junction boxes and elbows. Why aluminum die casting? For production aluminum parts. What is die casting tooling?